Lock in a great price for Athina Luxury Suites – rated 9.3 by recent guests! 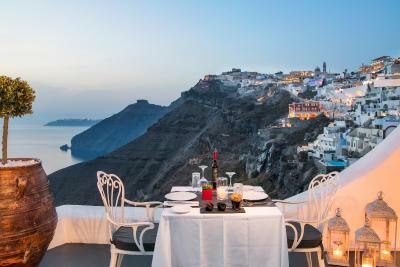 My husband and I were so impressed by the hotel's AMAZING location on the side of the caldera facing the unobstructed views of the sea below the high cliffs of Thira. We lounged in our private hot tub, enjoying gorgeous sunsets. The ATHINA hotel staff were friendly and attentive to our every need. We enjoyed every minute of our three-day visit! Christina was very sweet and helpful and went the extra mile to attend to our tour bookings and resolve an issue with an excursion. Facilities were extremely clean. Location was excellent. This hotel is one of the best hotels I have ever stayed in. My friend and I splurged and booked the honeymoon suite with a private hot tub and it was incredible. It was magical sitting in the hot tub at night drinking wine and enjoying the view. The room was clean, modern and comfortable. And the breakfast on our balcony each morning was plentiful and absolutely delicious. All these great things aside, what made this hotel the best was the staff. This hotel is a small family run hotel and you can tell from the service they are passionate about what they do. No request was too big or small, and were always happy to give recommendations (which were always on point). 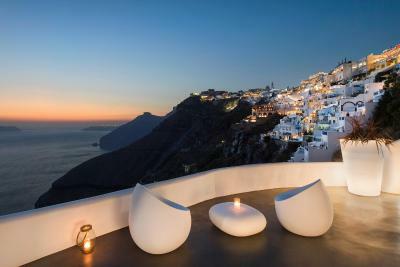 I will travel back to Santorini just to stay at this hotel again. The view is amazing and the service was outstanding I had one of the best memories in my whole life!! This hotel was beautiful. Great setting. They served breakfast right to your balcony which had a beautiful view. The only thing I would warn is that if you have trouble walking stairs, this location may be a bit difficult. I didn't mind the stairs as it put you in a beautiful cliffside location. The hotel was amazing! 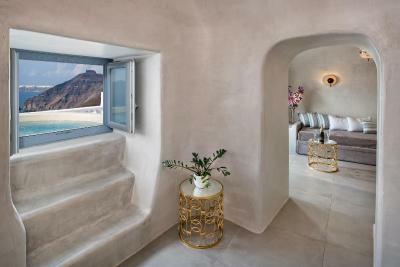 One of our top picks in Fira.Nestled upon a rock in Fira Town, the Cycladic-style Athina Luxury Suites feature a swimming pool and a sun terrace with panoramic views of the Caldera and the volcano. They offer air-conditioned accommodations with a balcony or terrace and provide free WiFi in public areas. 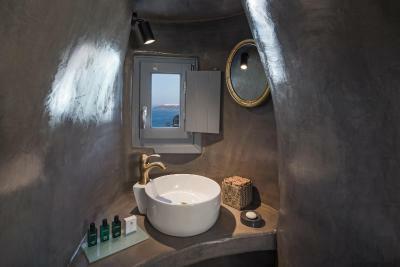 All units are comfortable and spacious, carved inside the volcanic earth according to the unique traditional style of the island’s architecture. They are all equipped with modern amenities such as flat-screen, satellite TV and iPod dock. 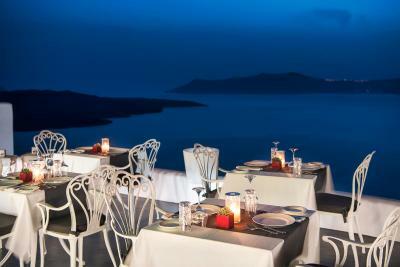 All units enjoy panoramic views over the Aegean Sea, the Caldera and the volcano. An array of meals, drinks and snacks are served at the property's bar restaurant, or at your suite. Several restaurants and bars can be reached within a short walk. 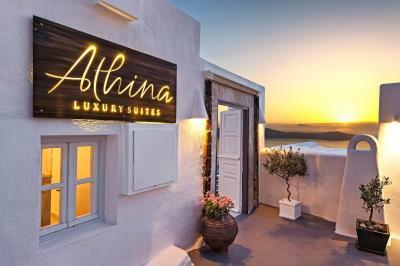 Athina Luxury Suites is conveniently located within a short walking distance from Fira’s center, where a variety of shops can be found. Ormos Athinios Port is 2.2 mi away, while Santorini National Airport is at a distance of 4.3 mi. 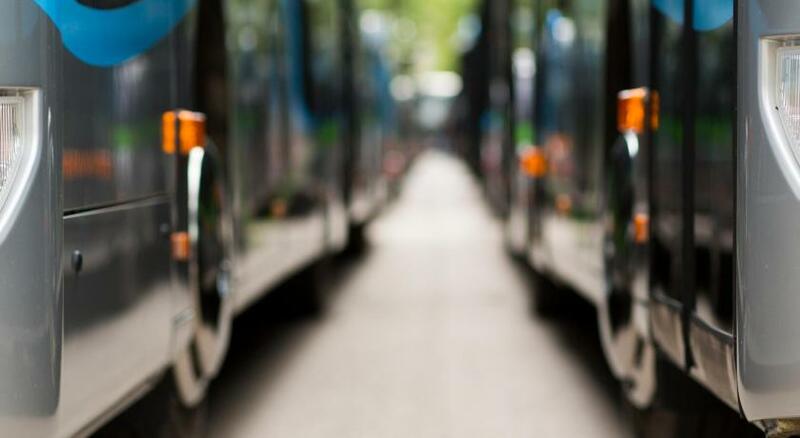 Airport and port shuttle service can be arranged upon request and at extra charge. 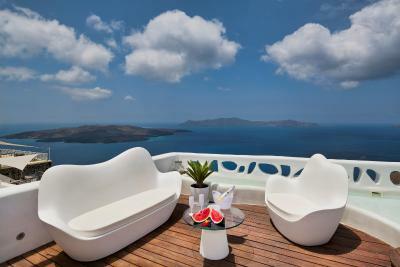 When would you like to stay at Athina Luxury Suites? 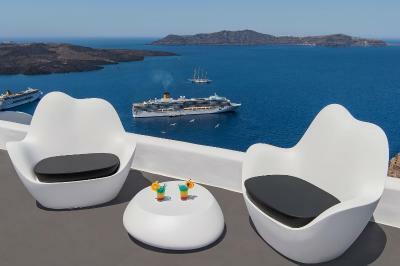 Opening to a furnished balcony with views of the Aegean Sea, the caldera and the volcano, this air-conditioned junior suite is tastefully decorated. It offers an open-plan bedroom and seating area with flat-screen, satellite TV. A bathroom with free toiletries, bathrobes and slippers is included. A mini-bar and free WiFi are provided. 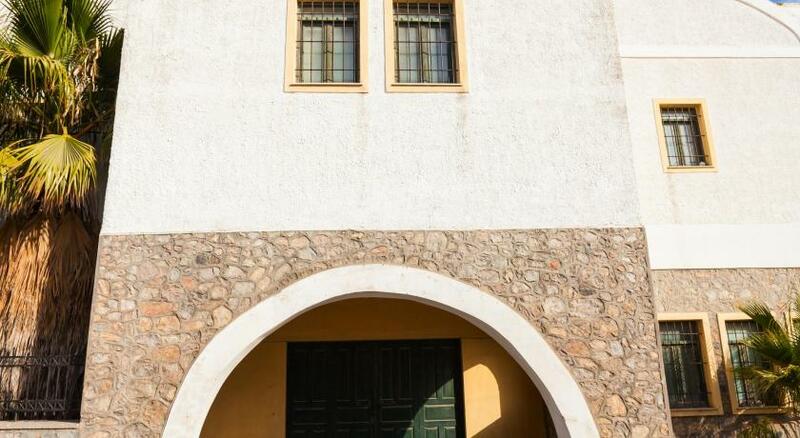 Opening to a furnished balcony with views of the Aegean Sea, the caldera and the volcano, this air-conditioned and tastefully decorated suite offers an attic with a separate bedroom. It consists of a living room with flat-screen, satellite TV and a bathroom with free toiletries, bathrobes and slippers. A mini-bar and free WiFi are provided. Opening to a furnished balcony with views of the Aegean Sea, the caldera and the volcano, this air-conditioned and tastefully decorated suite offers a separate bedroom. It consists of a living room with flat-screen, satellite TV and a bathroom with free toiletries, bathrobes and slippers. A mini-bar, free WiFi, a sofa-bed, a clothes rack are provided. Ironing facilities and bath amenities are offered. 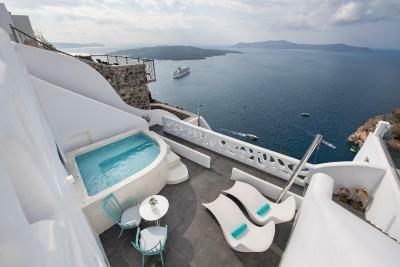 Opening to a furnished balcony with hot tub and views of the Aegean Sea, this air-conditioned and tastefully decorated suite offers an attic with a separate bedroom. Fitted with a self-standing bathtub, it consists of a living room with flat-screen, satellite TV and a bathroom with free toiletries, bathrobes and slippers. A mini-bar and free WiFi are provided. Opening to a spacious, private balcony with hot tub, sun beds, lounge and dining area and views of the Aegean Sea, the caldera and the volcano, this air-conditioned and tastefully decorated suite with a marble floor offers 2 separate bedrooms. Fitted with a fireplace, it consists of a living room with flat-screen, satellite TV and a fully equipped kitchen. Free toiletries, bathrobes and slippers are included in the bathroom. Free WiFi is provided as well as pool towels and a closet. Guests are benefited with a private entrance, a safety deposit box and an office desk. Please note that VIP services are available on request. Please note that this room type can accommodate up to 6 guests. Featuring an outdoor infinity hot tub, this traditional yet luxurious soundproofing air-conditioned suite offers views over the volcano, the sunset and the caldera. A closet, a safety deposit box and a dressing room are available. Guests are benefited with a tile/marble floor, a desk, a socket. Bathroom comes with bath amenities, a hairdryer and a shower. A satellite-TV is available as well as a fruit, wine, a coffee machine, a mini-bar and a refrigerator. 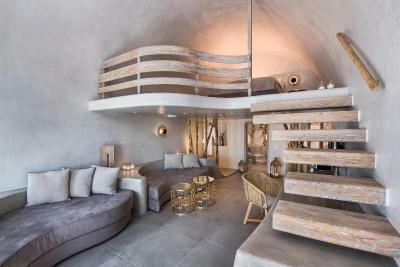 Overlooking the caldera, this air-conditioned suite features a very spacious balcony, an outdoor hot-tub, a private entrance and unique interior design. 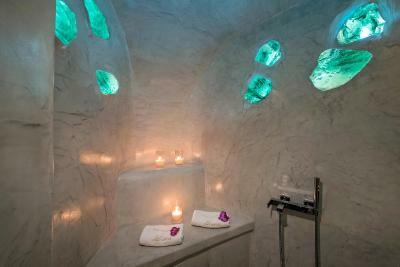 Cave Suite comes with a sitting area, a private-bathroom with a walk-in shower and bath amenities. Guests are benefited with a clothes rack, a flat-screen TV, an Ipad, a sofa-bed, a dressing room. Ironing facilities and pool towels are offered. Kitchen comes with a mini-bar, a refrigerator and a coffee-machine. Overlooking the caldera, the Grand Cave Suite is a very spacious, loft-style marble-floor air-conditioned soundproofing suite, with indoor and outdoor hot tubs. 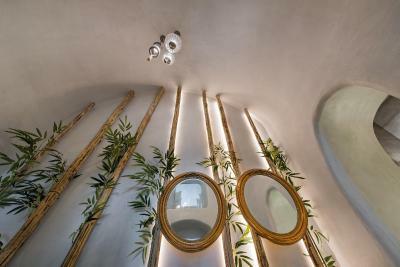 The unique decoration combines traditional materials with luxury and simplicity. There is a sitting area, a private bathroom with bath amenities and a walk-in shower. Kitchen comes with a mini-bar, a refrigerator, a coffee machine. 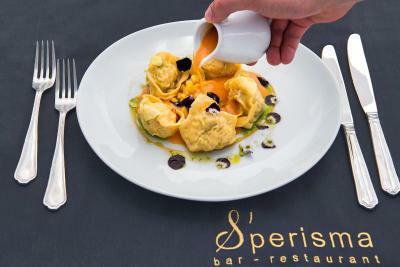 Guests are benefited with an Ipad, a flat-screen TV with satellite channels, a clothes rack , a sofa-bed. Ironing facilities are provided. 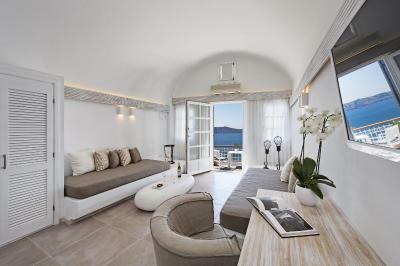 Totally private with amazing sea views of the caldera, this suite has a king size bed and a seating area. The balcony is private. This suite features a balcony, electric kettle and soundproofing. 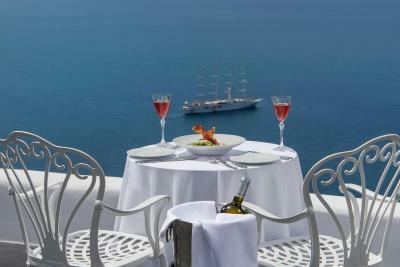 Hospitality is Greek and here in Athina Luxury Suites, you will comprehend the true meaning of it. We are looking forward to meeting our guests! 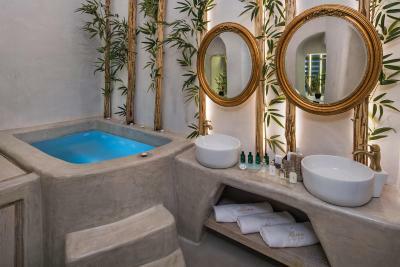 House Rules Athina Luxury Suites takes special requests – add in the next step! Up to two children under 12 years are charged EUR 100 per night when using existing beds. Athina Luxury Suites accepts these cards and reserves the right to temporarily hold an amount prior to arrival. Please inform Athina Luxury Suites of your expected arrival time in advance. You can use the Special Requests box when booking, or contact the property directly using the contact details in your confirmation. The master loft suite was awful...absolutely no head room on the bed platform...had to crawl into bed which was a mattress on the floor..this was not made clear in the adverts..my 6.1inch partner bumped his head badly several times. I had to sleep on rhe sofa as could not climb the narrow stairs up to the low loft...Awful! I booked petit cave suite with outdoor hot tub in their hotel on begin of October. I did a full payment by cash instead of credit card. However , i received my bank statement that my credit card being charged a full amount of the room. I tried to get an answer from them, is that anything went wrong or what. They won’t ever reply to give me explaintion ever I was past guest. This is very rude and bad customer service!!!!!!!!!! I can under stand that it might be a problem getting one of the sun beds by the pool, since there only 4 of them. For us, it wasn't a problem since we were there at the end of October in the low season. Sitting on the sun bed, overlooking the Cauldera was truly magical..
Beautiful Hotel. Great room with views overlooking the Caldera. The deluxe suite was very large. The staff was incredibly accommodating, especially heating our Kosher Meals for us over Shabbat.. The staff meets you where your cab drops you off and carries the luggage to your room.. Can't imagine a better place to stay. Great property in a great location. That we had to come home! The whole place was absolutely perfect, we had the best honeymoon and definitely will go back. People left towels and personal belongings on pool beds for hours. Great location. Fantastic helpful staff. The interiors of room were beautiful, clean and fresh. Lunch was amazing. The highlight of my Greece trip! 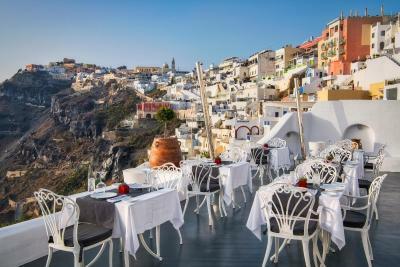 Note that the cliffside location of Thira requires visitors to do a lot of walking up and down stone stairs and cobbled walkways. ATHINA can arrange for their guests' luggage to be carried up and down the hill to a public parking area which is close to the public bus station in Thira. This hotel is just astonishing! 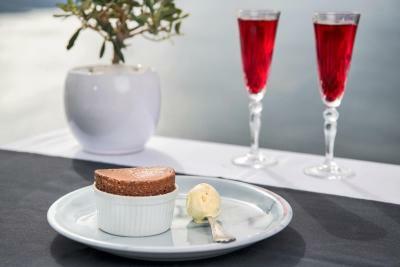 Amazing place for romantic get-away, with great service which is taking care about each and every detail of your stay to make is as pleasant as it can be, not to mention beautiful rooms where starting from designers towels and finishing of best quality washing products everything is set to make it amazing for you. I DEFINITELY recommend that hotel. Had an unforgettable experience here! There was a problem with our honeymoon suit at first night so they even gave us a bigger room(royal suit) to apologize! We really appreciated that! View,people and location everything’s great! They let us wait anywhere in the hotel till our plane time last day which was also kind and help carry our baggages upstairs. Breakfast was amazing! So many options and they were all delicious. Thr location of Athina was superb. The views were amazing. 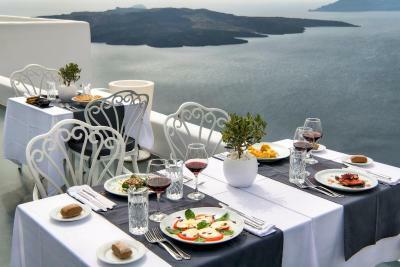 I loved eating a gorgeous breakfast overlooking the Caldera on our balcony. The food in the restaurant was delicious. Would deginately recommend this place for a romantic break. The staff couldn't do enough to make your stay perfect. Loved the extra touches of a room upgrade and a bottle of wine on arrival. Amazing! Unexpectedly, got an upgrade for free for the Royal Suite! We couldn't believe our eyes! The staff super helpful! Excellent service! The view breathtaking! We didn't leave the balcony or front yard for 24 hours! Didn't want to miss a thing! And of course we plan to go back!